“Books find people,” Jennie likes to say, but she been known to help facilitate that connection for students, family, and friends. You’ll find Jennie at book festivals on the weekends, adding to her extensive collection of illustrated mythology books, poetry in different languages from around the globe, Southern fiction, biographies, memoirs, and more. 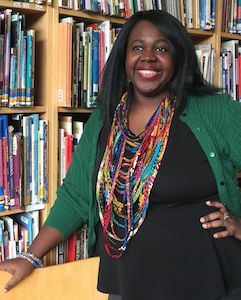 Having skipped half of high school to start college early, Jennie has focused her teaching career on the middle-school grades where “you get the lucky opportunity to light that fire.” She began her teaching career at her middle-school alma mater in Jackson, Mississippi, and taught English in D.C. public charter schools before coming to FCS in 2015. Jennie is the coordinator of the Capitol Area Progressive Schools network, a Fellow in the Conference of English Leadership, a state coordinator for the school literary magazine group REALM, and a published member of the Society of Children’s Book Writers and Illustrators. Her daughter, Ellison, is a 1st grader at FCS.